If you want your wedding to be perfect, nothing helps like a great venue. It can do a lot to enhance your special day and bring out the right kind of mood. It will also provide a great background for some awesome shots for your wedding pictures. I’m very happy to be a VT wedding photographer because Vermont has some great venues where you can have your dream wedding. You’ve already set the date of the wedding and now you’re ready. You’re getting married to the man of your dreams and you know exactly how you want the wedding to be. Now you just need to worry about the venue. Whatever it is, it needs to be the cherry on top so you have a fantastic wedding. Here are some elements to look out for when you’re hunting for the perfect wedding venue. The décor matters a great deal. Whether it’s the draping or the furnishing, lighting or the table decorations, the backdrop for the wedding needs to be perfect and to conform to you and your significant other’s tastes. You might be romantics looking for white draping and soft lighting. Alternatively, you might be more into rustic, earthy themes that give a homely feeling. You might even be bold contemporaries looking for pop-themed décor. Whatever décor you choose, make sure the venue is capable of providing it in a way that makes you feel like you own it. The last thing you want at your wedding is disgruntled guests. Whatever venue you choose needs to have service personnel who know how to treat and handle your guests. They should ideally have been trained by a professional maître d’hôtel. The service personnel should be able to exceed the expectations of your close friends and family and be ready to assist them, giving them a great and unforgettable experience from beginning to end. One of the aspects of service that many venues overlook is providing some variety to the couple as far as caterers are concerned. Some couples have their own caterers. They would like to be allowed to bring these caterers around with them and have them take charge of the entire event, taking care of their guests from beginning to end. Other couples might prefer to hire a caterer that has been recommended by the venue management. A good venue should be working closely with a variety of caterers and give you a varied list to choose from. We live in the 21st century, where streaming your wedding is the norm. This could be for future viewing as well as to give loved ones who are distant the opportunity to experience the wedding as if they were physically there themselves. You should also be able to stream time-lapsed photos of you and your significant other. This acts as some kind of diary, showing the two of you since your childhood days, up until the present day. The photos can be curated by you and your friends so you only stream the ones that best tell your story. A good venue should have the requisite resources to make all of these things possible. This mostly depends on if the venue also provides catering. Everything should be just right. For many of your guests, the meal will have a significant impact on their opinion of your wedding. Make sure the entrees are just right, as are the main courses and the desserts. Good venue management will try to make sure the drinks and cocktails are appropriate for the wedding theme you have chosen. If your wedding is sophisticated, some champagne will go well with the celebrations. If it’s laid back, craft beer might be a better idea. When everyone is done with the formalities, they’ll want to loosen up and wind down. A good venue should be spacious enough that everyone feels free to walk around and mingle. Don’t forget there will be music, meaning everyone will need plenty of space to dance the night away. Of course, this will be a special night for you and your groom as well, meaning you’ll need that extra room to have your romantic dance. Depending on the number of guests you’ve invited, you’ll need to find a venue with space to match. Whatever venue you choose, it needs to be just right. Make sure it captures the hearts of you and your significant other first. If it does, it’s bound to capture the hearts of your guests as well. A VT Wedding Photographer has a plethora of venues at which to capture beautiful New England wedding scenes. Vermont is a perfect place for a wedding event regardless of the season. This outdoor fall wedding at the Quechee Inn at Marshland Farm was no exception. The Quechee Inn is a remarkable location for any VT Wedding Photographer and for a lovely autumn wedding ceremony. In this image, the groom and his bride stand outside at their Jewish wedding ceremony, beneath the chuppah. The chuppah is an intricate part of a Jewish wedding ceremony and typically is formed by four thin pillars of wood that are connected by a cloth canopy. The bride and groom stand under the canopy, which is symbolic of the home they will soon share. Attention is mainly on the groom in this photograph. The bride stands in the forefront of the picture, but her image is blurred and set in shadow. The groom’s face is lit by the late afternoon sun that shines down on their blessed union. His face glows in that light, and radiates with the happiness he feels in this moment. 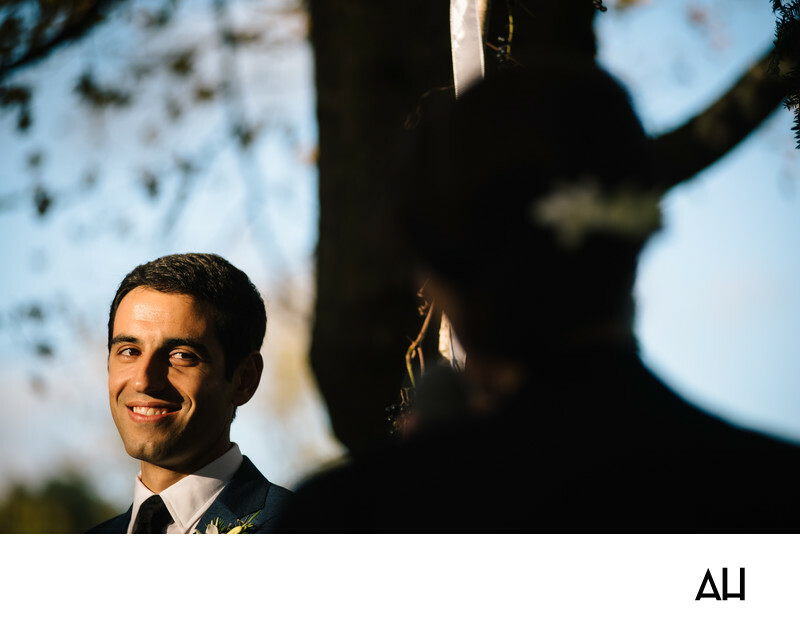 His dark eyes are focused on the bride, who he can’t help but smile at. It is a smile that has been seen on the face of the groom since the moment he saw his soon-to-be-wife walk down the aisle. Behind the groom blue skies are seen beginning to change color through the dark autumn leaves. The Vermont fall air grows chilly as evening approaches, but the groom and his bride are warm with the love that fills them on this day.